CMP공정 시험기 Model CP-4-->새모델 TRIBOLAB CMP 새모델 자료 준비 중 입니다. 축소된 CMP MACHINE에 특수 센서기술을 동원하여 CMP Polishing의 최적공정 선정 및 분석 시험기. 최적환경 선정및 가공환경 기술 평가용입니다. 매우 경제적인 EPD 최적화 기술을 모의 시험 할 수 있습니다. CMP TEST MACHINE 이 커지고 무거워져 내부 장치 교체가 편하고 시험기가 더 안정되고 정숙 해졌습니다. 제어기 PC와 시험기 사이에 있던 시험기 내외부의 복잡한 케이블 선을 제거하고, USB CABLE 1개로 시험기를 제어하고 데이터를 획득하도록 하여, 복잡하고 무거운 케이블 선의 연결 부위들이 고장을 일으키는 고장 예방 보전 능력이 크게 향상되었습니다. 시험기 구매 설치 4~6년 후 새로운 신형 PC로 쉽게 교체가 가능합니다. 따로 동작 제어와 데이터 획득 보드 등의 업그레이드가 필요 없습니다. 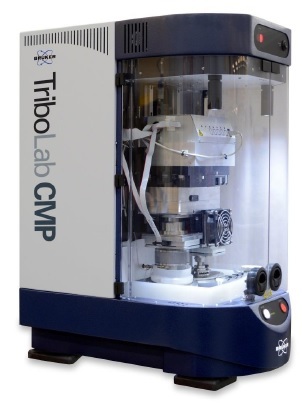 Our world-leading expertise in tribo-metrology has just been utilized in the latest product - CMP Tester. It is based on the latest technological advances and is the most precision and unique instrument of its kind. 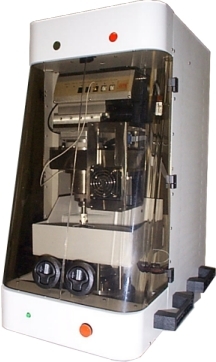 Here you can see the recent CETR presentation of "Quantitative Functional Testing of Consumables Using a Bench-Top CMP Tester" at the CMPUG Meeting of the Northern California Chapter of American Vacuum Society, September 2001.
with efficient copper polishing without delamination of silicon carbide from low-K material. - contact high frequency acoustic emission AE via proprietary sensors and amplifiers. Upper specimens: wafer coupon, sliding laterally by 1?back and forth at 5 mm/sec,4.25? conditioning disc, being rotated by a polishing pad. Lower specimens: polishing pads, rotating at constant speed. Dependencies of coefficient of friction (COF) and acoustic emission signal (AE) at different loads and speeds for Low-K , SiC and Cu top layers are presented in a summary table below. AE reflected regimes of material removal (<0.1 for floating, >1 with peaks for delamination, smooth curves for polishing). 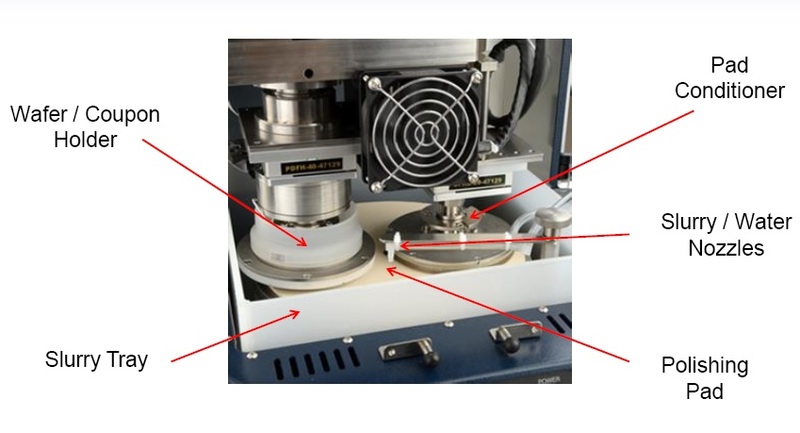 The above data has allowed to determine the optimum CMP conditions, at the highest polishing rate with no delamination, then confirmed by the data presented in the document below.